Did you know that it can cost up to 18 months’ salary to lose and replace a manager, and up to six months’ salary to lose and replace an hourly employee? If those numbers sound alarming to you, you’re not alone. While it’s commonly known that turnover can affect your bottom line, most companies are unaware of the true cost of employee turnover. At the beginning of a new year, employees typically look for fresh starts and new opportunities. Boom – Turnover. Unsurprisingly, this is a massive headache for managers, as losing valuable employees can be stressful and time consuming to deal with, not to mention it’s tough on the checkbook. 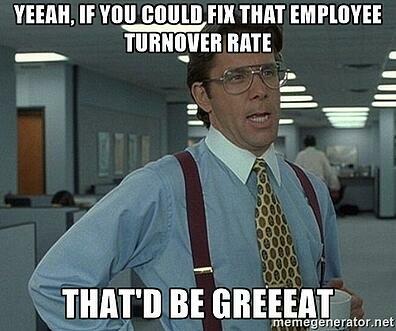 So, why is the cost of turnover so high? Which industry is faced with the most employee turnover, why? It is then evident that a great deal of turnover is completely preventable by providing employees with recognition and opportunity. Concerned about your employee retention? There are several key factors that would cause employees to stay or leave a position. What are some retention tips to minimize turnover? Someone does a job well? Tell them they have done well. Recognition and appreciation are very strong motivators. Always communicate clearly and effectively with your employees when designating work. When expectations are misaligned, miscommunication and avoidable errors can cause frustration with the position. Provide employees with better, more constructive feedback to allow them to see clearly what steps they need to improve and become successful in a role. Ask an employee for their input before you make a decision that affects their job. Make sure employees are set up for success – provide access to all resources necessary to complete their job. Share information with your employees – let them know you trust and appreciate them! By implementing these retention practices in your workplace, your employees will certainly take notice of the effort you’re making to engage them and display your appreciation. The best part is, these practices are completely free. For more insight into the implications of making new hires in your organization, download TPD’s Real Cost of Hiring Worksheet!